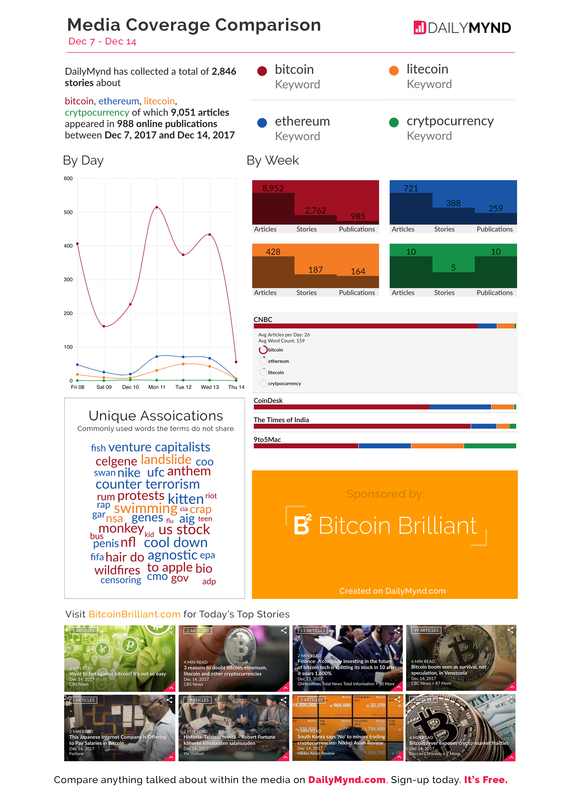 Dec 7 - 14: Media Comparison Report: Bitcoin, Ethereum, Litecoin, Cryptocurrency. The following is a media coverage report which analyzed over 9,000 articles mentioning Bitcoin, Etheruem, Litecoin, and Cryptocurrency between December 7th and December 14th 2017. It's clear consumer branding has made Bitcoin synonymous with Cryptocurrency. This report was created on DailyMynd.com. At this time, it's still a free content curation, automation, and research platform. We particularly like the compare feature, which is what we used to generate this report. Get daily, morning news digests and your most current Bitcoin news and cryptocurrency news at http://www.DailyMynd.com. Disclaimer: they are friends. We like giving a shout out to people and companies doing cool stuff. Here is information about the tool we used to generate this report, curate content, generate our content site, and many more features. Here is a quick video preview we found too. Disclaimer: We're happy to help promote your service too if it provides value to us. Please don't hesitate reaching out and letting us know what you're up to. Until then... have a profitable day.